New spawning habitats are bringing salmon back to a stretch of the River Avon. In a five-minute spot survey this autumn, the Westcountry Rivers Trust counted 21 juvenile salmon on a stretch of river where no salmon or trout were counted four years ago. Over the last three years, the Westcountry Rivers Trust has added 700 tonnes of granite gravel to a 2.5 mile section of the River Avon, near Shipley Bridge on Dartmoor. Like many rivers, the Avon has lost a number of natural gravel beds because of obstacles, such as weirs or dams, which prevent stones from travelling down the river. Funded by South West Water, as part of the National Environment Programme, the project aims to increase the number of salmon and trout by creating new gravel beds. Adult salmon lay their spawn in freshwater gravel beds, known as ‘redds’, in the autumn and the eggs hatch in the winter. 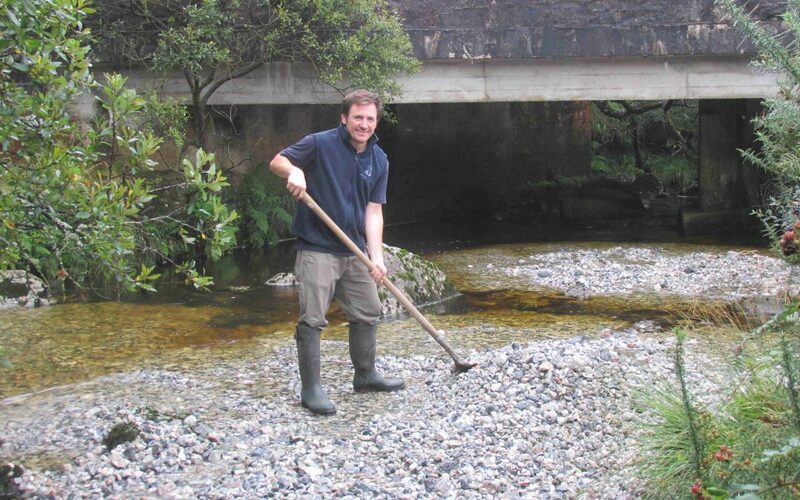 Matt Healey, Land and Fisheries Officer for the Westcountry Rivers Trust said: “We are absolutely delighted to have counted 21 juvenile salmon in a stretch of river where they were previously completely absent. These were juvenile fish, which hatched this year, so we know salmon are now spawning in our new gravel beds. This is an incredibly positive result. Gravel has also been added to over half a mile of the River Teign, below the South Teign, and a stretch of the Haddeo on Exmoor. By adding stones of different sizes, the Westcountry Rivers Trust is aiming to make the new habitats as natural as possible. University of Plymouth researchers have electronically tagged some of the stones to monitor how the gravel moves over time. This research will help scientists assess how successful the project has been in creating spawning habitats. Find out more about WRT’s work across the Westcountry.